You can never be in Macau without a photo of the St Paul ruins, this is the landmark of Macau. Now a UNESCO World Heritage site. It is a 17th-century Portuguese church dedicated to Saint Paul the Apostle. This is the everyone favorite Macau tourist spot. We took a taxi from A-Ma temple, just 10-15 mins as there was some traffic near the ruins. The original structure was made of wood which was burned down in a fire leaving only the granite facade and 68 stone steps up. Be prepared of the tourist crowd and I doubt you are able to get a good picture. At the foot of the St Paul ruins, you find plenty of souvenir stores and street food. There are several must-try street foods you may want to try when you are in this area. Check them out. It usually costs 10 HKD or 10 Macanese pataca but sometimes you can get it at 8 HKD or Macanese pataca. The beef offals braised for hours in curry broth, fish balls & white reddish. This is very common street food in Macau and Hong Kong that one should give it a go. The meat is quite soft and tender. This is another common street food in Macau and Hong Kong. Street food usually cooked in a big pot and braised for hours. Do ask for the price before you order as some stores do not put up the price and you may get a shock when they hand you your order. There is a long queue in front of Smuki, selling crunchy baguette filled with cream. If you love cream stuff, this is for you. HK20-22 each. Kumquat Lemon tea is an iconic drink in Macau and Hong Kong. It is a good for sore throat and quick relief if you have some cough. According to traditional Chinese medicine, Kumquat helps eliminate phlegm. Outside Yeng Kee Bakery, you are allowed to taste as many types of biscuits as possible. They offer eggroll, almond cookies, mooncake & candy. Koi Kei Bakery is all over Macau, there is one near A-Ma temple too. You also get to try all the cookies before you made any purchase. This is a very small temple hidden in an alley at the foot of St Paul Ruins. Loi Wo temple is dedicated to the Goddess of Nuwa. There is nothing special about this temple as it is quite similar to ordinary houses, except it is painted in bright orange yellowish color. Only half of the Temple left after a fire in 1914. You only need few minutes to take a look. One thing you will notice immediately when you are at Senado Square is the wave-patterned mosaic of colored stones which was done by some Portuguese experts. The buildings around Senado Square has many western elements and colorful, at the windows you will notice intricate details work. When I was in Portugal or Europe, I notice there is always a square in the middle of the city center. It was said that the square is for public gathering, events and celebration. Similar to Portugal or European concept, Senado Square is also used for the Chinese new year celebration, Christmas and New Year celebration. Expect to see lion dance & firework during the festive season. Senado Square was also listed as a UNESCO’s World Heritage list in 2005, the big square is full of tourists most of the time and at there are retails shopping and restaurants. The white building is Leah Senado Building which you also may want to take a good look. It is located across the Senado Square. The building is neo-classical in design, and the exterior has retained all of its original. Luis De Camoes statue was found here at the Leal Senator Building, the guy is the most important poet in Portugal. I have seen one of his poem in the westernmost of Europe in Cabo da Roca Portugal. Original master walls with Azulejos tiles, also the Portuguese icon. This is the Portuguese and Spanish painted tin-glazed ceramic tilework. I have seen similar tilework at Cabo da Roca Portugal. A beautiful 16th-century Baroque-style church mixture of Macanese features in its design eg the Chinese-style roof tiles and doors are made of teak. It is situated near the Leah Senado Building. Visitors are allowed to go in free of charge. You will notice The high altar of St Dominic’s Church. This is another historical landmark in Macau which was built in 1929, it is the general post office, located near Senado Square. The building looks very much similar to the one I saw in Madrid Spain (The Metropolis). 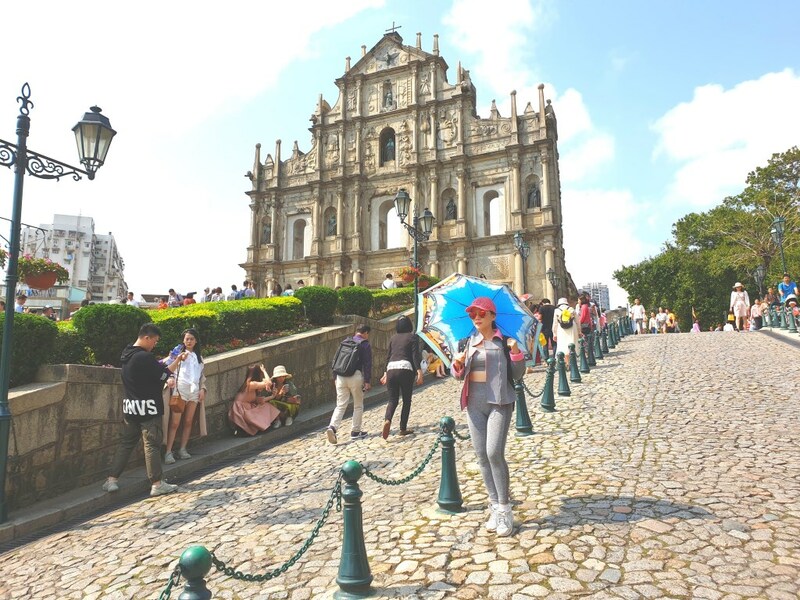 St Paul Ruins is the must visit place in Macau. Glad to have spent few hours strolling the iconic landmark and few other monuments nearby. What surprised me about this city is precisely this area with its ruins and its beauty and apparently lots of things to do! St Paul’s ruin is the highlight in Macau and glad that there are so many other street foods at this area such as curry fish ball and beef offal. Macau has so many similarities with Portugal I have to agree and you can easily spot them since Macau is colonized by the Portuguese for so many years. Macau was only returned to China in 1999. I love traveling and hope to visit Macao one day as well. Great guide, it feels like lots of things to enjoy and experience! lovely! When you visit Hong Kong do remember to include Macau too as it is only one hour from Hong Kong ferry terminal. You can do one day trip. Never been to Macau, so I loved discovering this area through your post, and visit it virtually through your photos 😉 Thanks for sharing your experience! Glad you enjoy the pictures in this post. The most significant change for Macau since 1999 (after returned to China) has been the liberalisation of casino licences in 2001. You also get to see American casinos eg MGM and Sands here. It looks like there is plenty to do here – lots of lovely food and other stuff to experience! The foods here are pretty similar to the food in Hong Kong, except you also get to taste some Portuguese Macau cuisine here. Pretty interesting. I have a fascination with visiting heritage places and would love to visit this place and see in person. I’ve never been to Macau, but I’d love to visit! Can’t wait to try all the food and see beautiful architecture. The Portuguese founded Macau as a strategic port in 1557, it was also the training center for European Christian missionary-scholars in Asia. Since the Portuguese have been here for a very long long time, you got to see some traditional Portuguese style buildings and churches in this country. What gorgeous photos! I’ve never been here but definitely wouldn’t mind adding it to my travel bucket list. That food looks so interesting! What a gorgeous place to visit! I’ve never heard of Macau, but now I want to go! What an awesome experience! I really enjoyed looking at your photos; the ruins would be so humbling to visit! the food there looks very interesting! I would love to visit the yellow church! It’s beautiful! The yellow church is called St. Dominic’s Church, a beautiful 16th-century Baroque-style church mixture of Macanese features. Really pretty. That seems like a very lovely vacation and adventure! So much to take in between the sight and the history! How cool! Thank you so much for sharing. I love the photos and all of the history behind it! Thanks for your comment. It was my second time visiting Macau and this time I have more time to explore as I stay over one night in Macau. You can always do a day trip if you are visiting from Hong Kong. Ooh I really want to try a smuki now, it sounds awesome! This brings back some great memories of my time in Macua many years ago. I love the Portuguese influence and the churches are beautiful there! A really nice destination to visit. Smuki is a chain store in Macau and Hong Kong for those who love cream. Glad you have also visited Macau before and I am sure you enjoyed it very much. Stunning photographs. I have been to Macau had great time exploring heritage during day and enjoying casinos during night. Ok all of this street food is making me hungry . What a cool place to visit. This looks like such an interesting place to be! Thanks for sharing all the details!